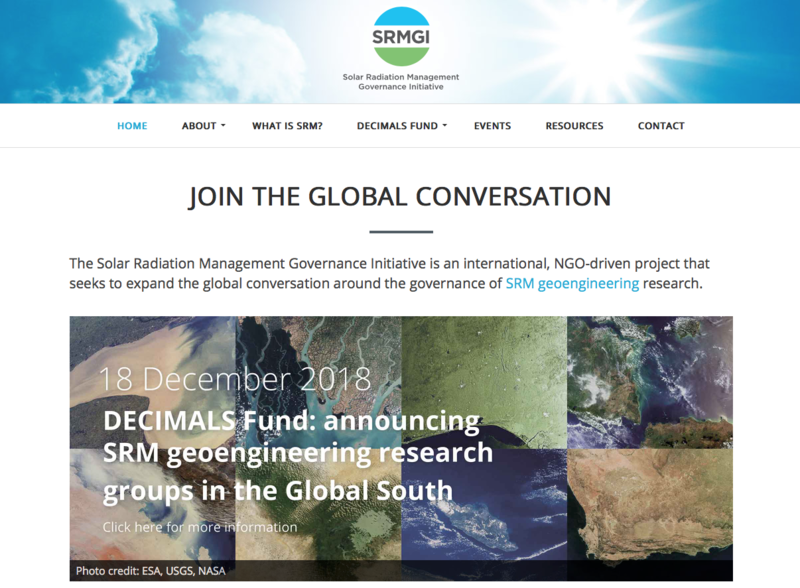 The Solar Radiation Management Governance Initiative is an international, NGO-driven project that seeks to expand the global conversation around the governance of SRM geoengineering research. Launched in April 2018, the DECIMALS Fund (Developing Country Impacts Modelling Analysis for SRM) is the world’s first international SRM modelling fund and the first exclusively for scientists from the Global South. From 2018 to 2020, the DECIMALS Fund will distribute more than $430,000 of grants to support Southern scientists as they research how solar radiation management geoengineering (SRM) could affect some of the world’s poorest countries and most climate-vulnerable regions. Eight teams were awarded DECIMALS research grants: in Argentina, Bangladesh, Benin, Indonesia, Iran, Ivory Coast, Jamaica, and South Africa. The 45 researchers involved in these projects will explore how SRM could affect, amongst other things, dust storms across the Middle East, droughts in Southern Africa, the spread of cholera in South Asia. The teams will work for two years, publishing their findings at the end of 2020. Seven of the world’s leading SRM modellers are working with the DECIMALS projects as research collaborators. These partnerships are a crucial part of DECIMALS as they will facilitate a two-way learning process. While the DECIMALS scientists are experts in modelling the local impacts of climate change, few have worked on SRM before. Similarly. the collaborators are some of the most knowledgeable SRM modellers but are not experienced in modelling its local impacts. Each team has been paired up with at least one SRM modelling expert and they will work together remotely over the duration of the DECIMALS projects.